Thanks for your patience during a hectime time for me and my family, I should be back for good now. Continuing the Ultimate Break, here are the two jersey cards, interestingly numbered 1/50, and 2/50 respectively. Both cards are FT.
Hank Blalock has his fans around the blogosphere, and these patches are one of the reasons I tried this product. We'll see if Blalock is signed by a team this offseason. 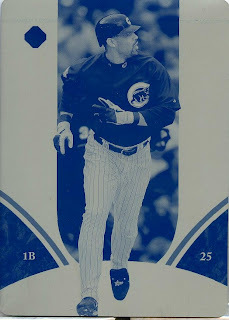 Beginning the box break, here is the bonus pack that promises a printing plate, Ken Griffey Jr. Buyback Auto, or a Legendary Materials card. I announced that I pulled a printing plate and gave readers a chance to win the card. Matt Pedersen! The first comment was also the best! Recently I pulled this Cam Newton auto. Today I managed to sell it for $625. Life is good. Cam Newton is officially one of my favorite players. 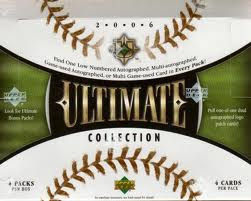 I also busted a box of 2006 Ultimate Baseball that I bought on Black Friday and I'll post it pack by pack. I'm giving away the bonus pack's 1/1 printing plate, and all you need to do is guess what team the player depicted on the printing plate is on (the team on the plate, not his current team). To eliminate a couple of teams it's not the Giants or A's or I would have kept the plate. It's also not the Yankees or Red Sox so there's no need for lots of guesses for both of those teams. If only I could make half as entertaining box breaks. He also bought packs for the kids in the store so kudos to The Glove.